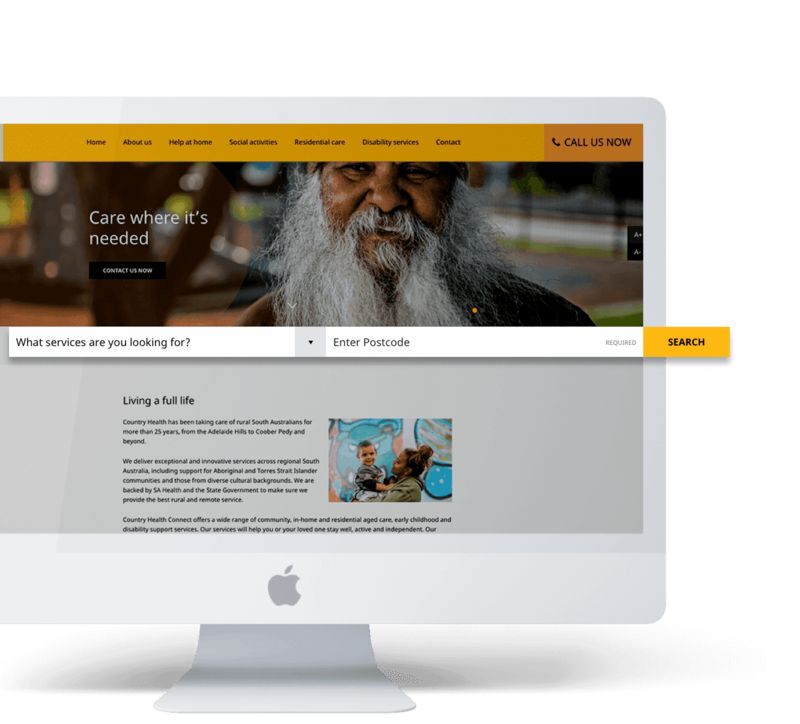 Redeveloped website for the South Australian provider of health and wellbeing support who have been taking care of rural Australians for over 25 years. They are under the umbrella of SA Health and the SA State Government and due to this, had previously only had an online presence as a landing page on the sa.gov website. 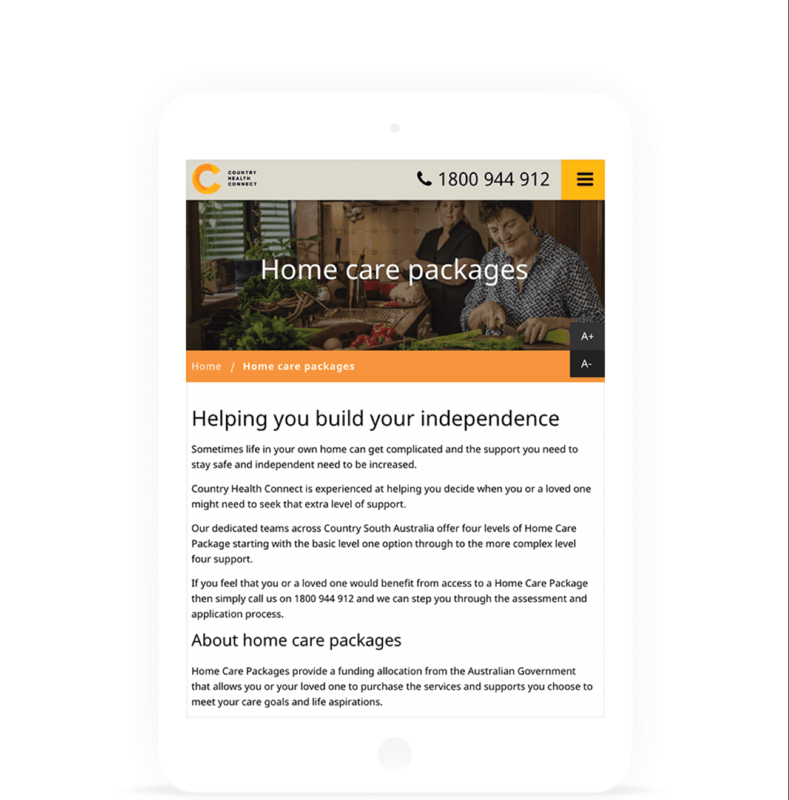 CHC approached The Digital Embassy to create a brand new website that was both independent of the SA Health and State Government websites. The largest challenge of this project was the launch deadline. The deadline was extremely tight and meant the website was unable to meet all requirements upon launch, so an alternative option was developed; being a landing page that provided a taste of what the new site would be like once completed. Additionally, there was quite a large number of requirements to fulfill as CHC is a government site and therefore was required to be compliant with government rules and regulations. This compliance involves customisation of the site to make it easier to navigate for the visually impaired. The customisation was created without compromising the look and feel of the website – which had been outlined in the initial goals of the website to be modern, clean and the user experience being paramount. 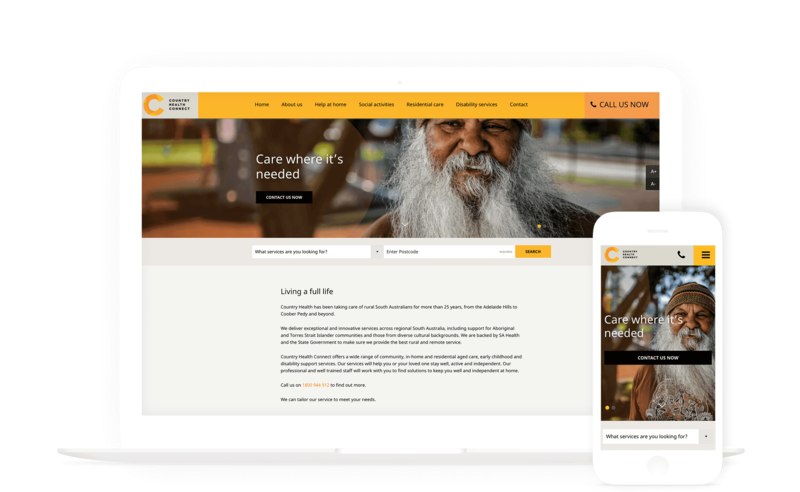 Another challenge CHC faced was their potential customers not finding their specific services from organic search methods and were instead ending up on the Country Health SA website. Two digital marketing campaigns were launched to help combat this issue via Google Adwords. Lastly, in order to measure user behaviour on the website and therefore track the success of the digital marketing campaigns, tracking logic and functionality had to be implemented into the website to record results. This tracking logic came in the form of call-to-action, such as the ‘Call Us Now’ button, which was required to be clicked in order to make contact with CHC. Due to the extremely short deadline that CHC required for the launch of the website, a landing page was launched to meet the extremely tight deadline. Basic information about the CHC was provided on this landing page. Furthermore, one of the interesting features of this website is the postcode services locator, which assists the user in finding the nearest locations where CHC provides services. It has an adjustable search radius, which can be utilised by CHC to display store or contact locations near their selected postcode. As mentioned in the challenges, the site was built for a government organisation. This meant it needed to be compliant with their regulations, such as catering for the visually impaired and the options to increase or decrease text sizes to improve visibility for the user. To make themselves more visible from a SEO perspective, due to their similarities with Country Health SA, the Google AdWords Campaign was launched. This involved targeting specific keywords present on the CHC website that potential users would be searching for. In doing so, the likelihood that the target market would be able to find appropriate services for their needs on CHC website would be more apparent. On top of the AdWords campaign, a remarketing campaign was also launched to target users that had already visited the site. This meant that customers who did not make a conversion after visiting the website would receive targeted advertisements. These advertisements acted as a reminder to potential customers to respond to calls to action. Both of these campaigns were extremely successful, with very low cost per result and improved rates of interaction and conversion. As mentioned previously in the challenges, tracking logic and functionality was implemented into the site to enable us to measure user behavior and the effectiveness of the calls-to-action. For example, instead of displaying the CHC contact number, a ‘call now’ button used instead, which would display the number when clicked. These clicks could then be measured and used to represent how many users were visiting the site in order to contact the company. The CHC website is built with The Digital Embassy’s own custom CMS, Consul™ specifically designed for business enterprise deployments. The platform is powered by WordPress and provides CHC with all the benefits of the WordPress CMS such as its ease-of-use content management features. In addition to these, Consul™ combines the best features of WordPress with new robust system architecture that can be customised and scaled to deliver the functionality, style and user experience (UX) for advanced business application purposes. CHC now has a brand new website, which has fantastic usability features which comply with necessary government requirements and improve the overall user experience. The website is responsive and has strategically placed calls-to-action, which was measured to track results and conversion rates. Upon conclusion, the CHC Google AdWords and Remarketing campaign has been extremely successful. The results show 79% (8430 visits) of traffic was sourced from paid search, while 12.57% (1341 visitors) were organic. It is evident in the results the paid campaign brought the majority of the traffic to the site for the campaign period. On top of this, 15,416 pages were viewed in the campaign period, with an average of 1.44 pages per session which is an extremely successful result.